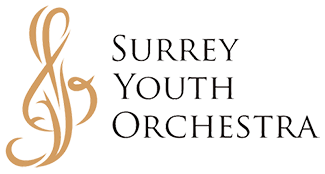 The Surrey Youth Orchestra offers young musicians an opportunity to meet new friends and find challenging and rewarding opportunities for artistic and personal growth. As a society, we all learn to work with others. Mutual respect, cooperation and sharing are important values in any social experience. The ability to work with and for others is an important part of the learning process. Any inappropriate or disrespectful behaviour will be dealt with so that the well-being and security of everyone in the society is ensured. Each member of Surrey Symphony Society can achieve excellence by committing to respectful and responsible behaviour, and by putting forth one’s best effort. Consideration, courtesy and respect must be shown to all students, parents/guardians, conductors and visitors to the Society. Swearing, bullying, harassment, racism, vandalism and stealing are not acceptable actions by any members of our Society. Be prepared for rehearsal. Bring your instrument, music in your music folder, a pencil and music stands as instructed. Be seated and ready to play. Arrive 15 minutes early prior to the posted rehearsal time in order to tune your instrument and be ready for instruction. Give your full attention to the conductor. Do not speak or play your instrument while the conductor is instructing you or other orchestra members. Minor disciplinary issues will be discussed with the student directly without involving or notifying parents/guardians. Parents should be aware that a disciplined student may be asked to leave rehearsal if the conductor decides this would be best for the group; that is, the student will be removed from the rehearsal for the day and parents/guardians will be notified to pick up their child. Progressive discipline could result in a student being removed from the Society. Each member of the orchestra is expected to take private lessons. Each member is expected to practice to prepare for rehearsals. The student is expected to attend ALL rehearsals, concerts, festivals and workshops. If a student is not able to attend a rehearsal or performance due to sickness or another emergency, the student must contact their conductor directly via phone or text message to inform them of their situation. It is expected that parents/guardians will arrange medical, dental and other appointments outside rehearsal hours. If a student misses 3 rehearsals, they will be asked to re-audition. In some situations, students with an important role in performances may be asked to sign a term of agreement, acknowledging their mandatory attendance at upcoming events. Students are advised to take extra caution to ensure the safety of their instruments during rehearsals and concerts. It is suggested that each family purchase insurance for their instruments. ​Surrey Symphony Society shall not be held responsible for any lost or damaged instruments. Students wear black socks and black dress shoes, black skirts that come to the knee or longer with black hose or dress pants (no jeans). They wear a black or white shirt, depending on which orchestra they are a part of. The Society will provide student members with scarves or ties to use at performances. Music folders are the property of the Surrey Symphony Society. They are handed out at the beginning of the season by the conductors of each orchestra. A yearly security deposit is required from each student member for music folders. Folders are collected at the final concert of each season. There will be no refund of fees if a student member withdraws before the end of the season. In a situation where a student is moving away or is no longer able to play (verified by a doctor’s note), a refund of half the fees will be considered until Dec 31st. Students in this situation must complete a withdrawal form available from the Society at gm@surreysymphony.com . Volunteering orchestra parents are part of the vitality of the Society. Parents are encouraged to volunteer in any number of ways – by providing snacks for rehearsals (costs are reimbursed), by helping with stage set-up before, during, and after concerts and events, by chaperoning during Charis Camp weekend or chamber music events, or by sitting on the Board of Directors. Volunteer opportunities are available all year long. 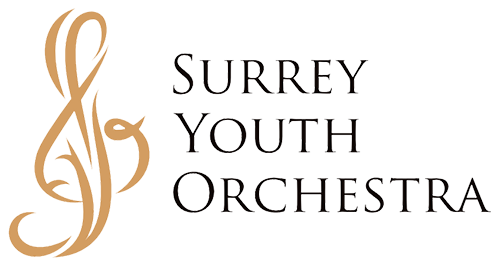 Parents may contact gm@surreysymphony.com for more information about volunteering.